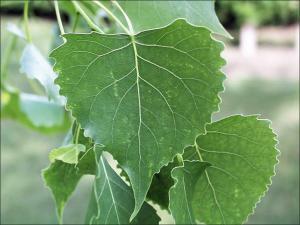 Eastern cottonwood (Populus deltoides) is the fastest growing and largest tree found in Iowa. It is not uncommon for young trees to grow in excess of 6 feet in height each year. The largest specimen in Iowa is over 11 feet in diameter, 80 feet tall and more than 85 feet in width. Mature Shape: Develops an open, spreading crown. Can become ragged and irregular with age. Site Requirements: Cottonwoods are tolerant of a wide range of soil conditions. Native to Iowa, cottonwoods grow naturally near water. Trees are tolerant of drought and air pollution. Seed Stratification: Seeds disperse in the spring and immediately germinate. No stratification period is needed. Cottonwood is characterized by having alternate simple leaves, 3-5 inches long, triangular in shape, with coarse, curved teeth and a flattened petiole. 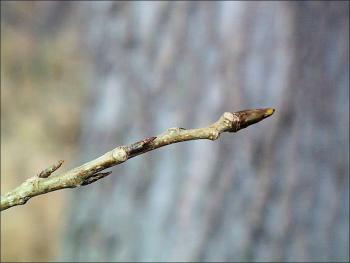 Winter twigs are moderate in diameter, gray or gray-green in color with a star-shaped pith. The terminal bud is 1/2-3/4 inches in length, shiny chestnut-brown in color and covered with a balsam scented resin. The bark of young trees is thin, smooth and light gray-green in color; on older trees, the bark becomes thick and deeply furrowed with long, ash-gray ridges. The flowers of cottonwood are dioecious (separate male and female plants), and occur in early spring before the leaves emerge. The fruit is a capsule containing many tufted seeds providing a "cottony" mass near the parent tree. 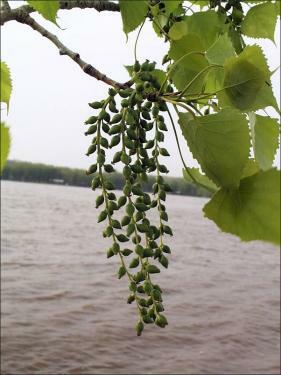 Cottonwood is native to all of Iowa, found growing along lakes, streams and wetlands where is does best and is well adapted to these wetter environments. Its preferred environment for rapid growth is the moist, well drained bottomland soils, but it will grow and do moderately well on a wide variety of sites from droughty uplands, to moderately wet soils. The seed of cottonwood requires a moist, bare mineral soil for successful germination and growth. Cottonwood is an easy tree to regenerate cuttings. Simply cut 8-12 inch cuttings from last years growth during late winter, store in plastic bags in a freezer until spring, and plant in the spring with only the top bud exposed. As a shade tree or landscape plant, cottonwood is not used extensively because it is not an extremely sturdy and durable tree. The advantage of cottonwood for landscape or windbreaks is its fast growth rate. For most shade or windbreak uses, select a male selection to avoid the cotton problem during seed production. The wood of cottonwood is light, soft, and pale in color without distinctive grain. Its primary uses have included pallet lumber, boxes and crates, hidden furniture parts, and more recently for dimension lumber.